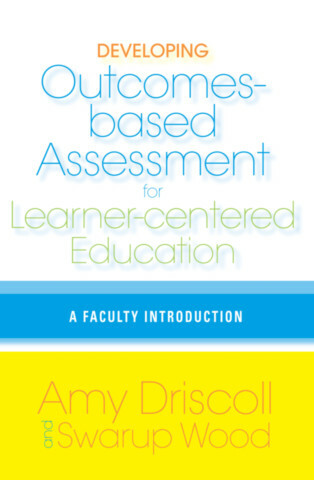 287 pp., 6" x 9"
Why Develop Outcomes for Assessment and Learning? Why Not? ; 2) A Culture for Faculty Learning about Outcomes-Based Assessment: Honoring and Addressing the Realities; 3) Outcomes—Articulating Our Learning Expectations; 4) Student Evidence: Designing Assignments and Assessments for Diverse Learners; 5) Criteria and Standards for Assessment: No Longer a Faculty Secret; 6) Faculty Responses to Development of Outcomes-Based Assessment Protocols; 7) Going beyond Making Assessment “Public and Visible”; 8) Alignment: Making Explicit Connections between Teaching Decisions and Learning Outcomes; 9) Reviewing and Analyzing Student Evidence: Constructivist Faculty Development; 10) Faculty Responses to Assessment of Student Evidence; 11) Moving to Outcomes-Based Assessment and Learner-Centered Education through the Scholarship of Teaching, Learning, and Assessment; Faculty Teaching Vignette One: Connection, Reflection, and Assessment: Assessing Learning Outcomes in a Multicultural Conflict Resolution Course; Faculty Teaching Vignette Two: Graphic Organizers Guide Students to Achieve Multiple Learning Outcomes: Constructing Meaning in a Community-Based Watershed Restoration Course; Faculty Teaching Vignette Three: First-Year Seminar: Orienting Students to Outcomes-Based Education; Commencement Speech; Assessment Web Site Resource List; Glossary; Annotated Bibliography; Index. "The personal approach of this book reads like a conversation with the authors, making it feel manageable. The case studies that begin each chapter provide a realistic perspective of the pitfalls and successes of outcomes-based education. There are many useful tools and perspectives provided throughout this book for faculty and administrators. The concept of creating a learning-centered environment is not new, but is clearly articulated throughout thus book. For institutions engaging in this kind of educational approach this is an excellent resource." "Assessment is not just about instruments and evidence. It’s about people and relationships, as this volume beautifully illustrates. Built around stories about what happens when educators put their heads together to focus on student learning, it provides an up-close and personal account of stumbling blocks, break-throughs, and successful strategies for harnessing assessment to valued educational outcomes."